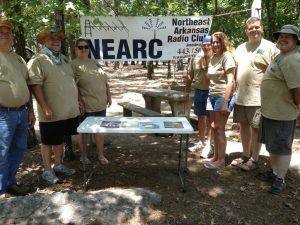 NEARC Spring swapmeet will be May 18th 9AM-12PM. Location is JP&O 5930 E. Highland Drive, Jonesboro, AR. 72401. Testing will be done if needed. The NEARC meets the first Monday night of each month at about 6 p.m. at the Jonesboro Fire Department’s Station 3 at 2212 Brazos ST. We encourage members to attend the meetings. Guests and other interested parties are always welcome. Yearly membership dues are $25.00 and this helps support club activities and projects. As always, we appreciate your continued support. The club owns & operates the 443.150Mhz repeater from high atop Centennial Bank Stadium on the campus of Arkansas State University. It features a 2 meter remote base & voice alerts you when severe weather alerts are received from the National Weather Service. The repeater itself is a Kenwood TKR-850 with an Arcom RC210 Controller and a 16 bay Decibel Products antenna. Check out some recent photos of one of the group outings.